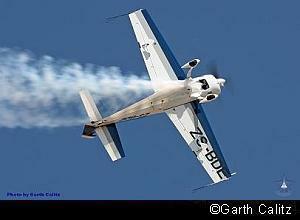 The 2011 Secunda Airshow was held on the 20th August. The show was very well attended with many aircraft flying in for the day. The day was started on a very sombre note with a "missing man formation" fly past by the Flying Lions, in remembrance of the 13 victims of the Albatross accident which happened a week before. Our sincere condolences to all the families and friends affected by this disaster. 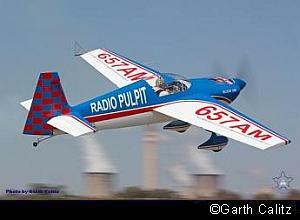 The displays were kicked off by Johnny Smith flying a very smooth display in his Radio Pulpit sponsored Slick 360. 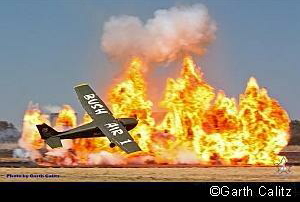 Next on the cards was a display of flying brilliance coupled with pyrotechnics by CC Pocock in his Cessna 172. The crowds that made their way to the airfield were completely blown away by the "wall of fire", once again expertly executed by CC. 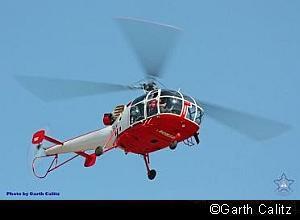 This was followed by a brilliant helicopter display by the Hughes 369D. The public were offered flips in the Dakota DC3 flown by veteran pilot Flip Vermeulen, a Bell Jet Ranger and a Harvard from "The Harvard Club of South Africa" piloted by Ivan van der Schaar. Throughout the day all three operations were very busy. Secunda locals were treated to a host of amazing displays throughout the day and the program was very well planned so there was very little quiet time. Stan Oliver entertained the crowd with a well flown display in his beautiful Extra 300. 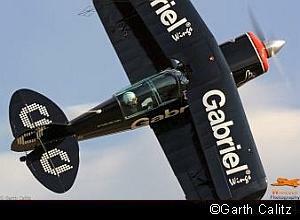 The Airspace was then filled by the screech of Pitts Specials as it was the turn of Team Gabriel Wings. As usual the crowds were mesmerized by the superb display put on by Scully Levin, Ellis Levin, Arnie Meneghelli and Stu Lithgow. 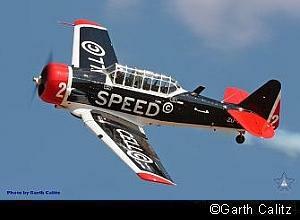 The focus the switched from American to Russian Aircraft in the form of a Yak 52, expertly flown by Neville Ferreira. 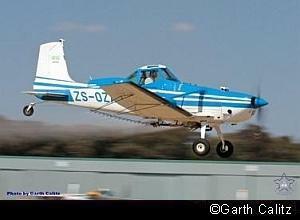 A Cessna 188 Agwagon supplied a sample of the life of a crop sprayer doing several very low and fast passes. Hugo Visser took to the air in his magnificently restored Allouette III, showing why it was used for many years by the SAAF in a variety of rolls from a light troop carrier to gun ship, and used for top cover as other aircraft arrived and departed at frontline bases during the Angolan bush war. 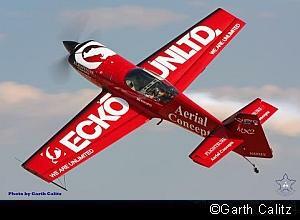 Barrie Eeles wowed the now ever swelling crowd with a wonderful display of precision flying in the Extra 300. Barrie like many of the other display pilots is also active in aerobatic competitions, both locally and internationally. Brad Bennetts and Ellis Levin kept the patrons entertained with a display of aerial ballet that will rival any international display. 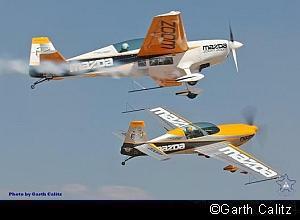 The Mazda Zoom Zoom team have become famous for the mirror image display they so effortlessly perform. Both Brad and Ellis are airline pilots. The relative quiet of Secunda was shattered by the sound of Radial motors, first by the DC3 of Flippie Vermeulen as he masterfully maneuvered the "old bird" around the now very warm Highveld sky. He was immediately followed by the Harvards of the Flying Lions, now sponsored by Cell-C and flown by Scully Levin, Eills Levin, Arnie Meneghelli and Stu Lithgow. Local bikers took advantage of the opportunity to show off their hardware and race along the runway of an active airport. Skydivers from the local skydiving club treated all to a stunning display of their skill. Nigel Hopkins flew in for an impromptu display in his Aerial Concepts MX2, proving to everyone why he is rated as one of the best aerobatic pilots in the world. Graham Field closed off the show with a daring inverted drop from a Yak 52. 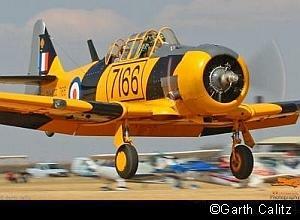 The organizers of this air spectacle can be very proud of the show put together at an extremely difficult time in the history of the South African airshows. Well done to all, we are all looking for what heights you will reach in 2012.